The flameproof glass is a special glass composed by two or more layers of transparent glass and fire-resistant insulation film or infused into flameproof solution. When firing, the side facing the fire is broken, when the temperature reaches 120 ° C, the insulation film will be immediately formed a solid conductivity protective shielding to prevent radiation and heat conduction live flame. 1.	fire-resistance and thermal insulation. 2. As a security building and furnishing materials, being of a good transmission, fire resistance, acoustic insulation, thermal insulation, warm keeping and shock resistance. Category A: the flameproof glass, which meets both the integrity of the fire-resistant and the requirement of refractory insulation. Category B: the flameproof glass, which meets both the integrity of the fire-resistant and the requirement of thermal radiation intensity. 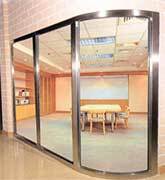 Category C: the flameproof glass, which just meets the integrity of the fire-resistant. It could be divided into two types of composite and chip as per the glass structure, and the composite flameproof glass also can be divided into two types of wet and dry. In use, when the type was not specified, the flameproof glass we said means A type, i.e. 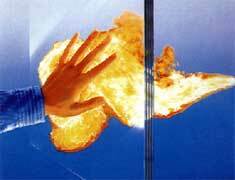 the glass with both the integrity of the fire-resistant and the requirement of refractory insulation. The refractory time was classified: 90min, 60min, 45 min. Conformity to GA97-1995 "the National Safety Standard of Glass"
And GB15763-2001 "the National Standard of Construction Use Safety and Flameproof Glass"